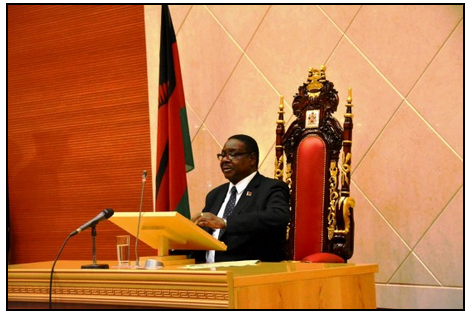 On 5 May 2015, President Professor Arthur Peter Mutharika opened the fourth meeting of the 45th Session of Parliament and the 2015/2016 Budget Meeting in Lilongwe. Mining received a brief mention. Mutharika focused on the potential of the sector, Malawi’s decision to join the Extractive Industries Transparency Initiative, the ongoing legal and policy reform in the sector, and the airborne geophysical survey. The President did not mention the “independent contract negotiating unit” that he said would be established during the State of the Nation address he gave last year (see here). Mutharika suggested that mining is currently contributing 6 percent to the country’s GDP which contradicts information from the Ministry of Finance, Economic Planning and Development. This Ministry indicated in April 2015, during the Publish What You Pay Malawi Coalition Annual General Meeting in Lilongwe, that the contribution of mining to Malawi’s GDP lies at around 1 percent given the suspension of production at Malawi’s largest mining project, Paladin Africa’s Kayelekera Uranium Mine last year. However, this data has been contested. The full address “Fulfilling our Promises” can be downloaded here, while the sections related to mining are copied below. The ongoing governmental review of oil exploration licences and production sharing agreements was not mentioned in the President’s address. Mr. Speaker, Sir, Government recognizes that the mining sector has huge potential in contributing to the country’s economic growth and development. For this reason, Government will continue to prioritise the sector with a view to increase its contribution to the country’s GDP from the current 6 percent to about 20 percent by 2020. Mr. Speaker, Sir, Government will reach this target by, among others, reviewing the legal and policy instruments, including the Mines and Minerals Act in a manner that safeguards the interests of the country. Government will also use the recently completed country-wide Airborne Geophysical Survey to attract prospective investors in the sector. Mr. Speaker, Sir, let me also report that in view of the commitment by Government to enhance transparency in the mining sector, Government will join the Extractive Industries Transparency Initiative (EITI) to promote revenue transparency. In this regard, Government will formally be applying for candidature under the EITI once all preparatory processes are concluded. Mr. Speaker, Sir, the transport sector is a linchpin to economic growth and provision of social services such as health and education. It is also a critical factor in revenue generating sub sectors like agriculture, mining, tourism and manufacturing.